I was visiting relatives in Canada and we went for breakfast to a nice little diner in Metcalfe, Ontario. They had paper placemats of nice quality so I turned mine over and started to draw a dragon. Then, I ordered blueberry pancakes with bacon and coffee. They bring the coffee in a mug with a spoon in it, so you know that this is a serious place. And, this being Canada, they distinguish between back and side bacon. I had side bacon. Anyway, I started the drawing and kept going until the pancakes arrived, along with some syrup. I do not think that the syrup was real maple syrup. That would not be acceptable in a serious diner. Metcalfe is a small town where my relatives appear to be well known. It sits on a very straight road in a landscape that is very flat. A dragon drawing was definitely just what was needed. Once I had taken care of the pancakes, I went back at work. I did not finish the work at the diner. The place was filling up and others would have wanted our table after a while. But, I did as much as I could that day which is what you see here. Since I started the drawing without much planning, there were a lot of mistakes to fix and I had to turn a coffee stain into a hanging moon. We left the following morning, back to the big city and there was no question that my dragon was staying behind. I took a snapshot with my phone, trimmed it up and here it is. I am not sure of the size but it is a pen and ink. 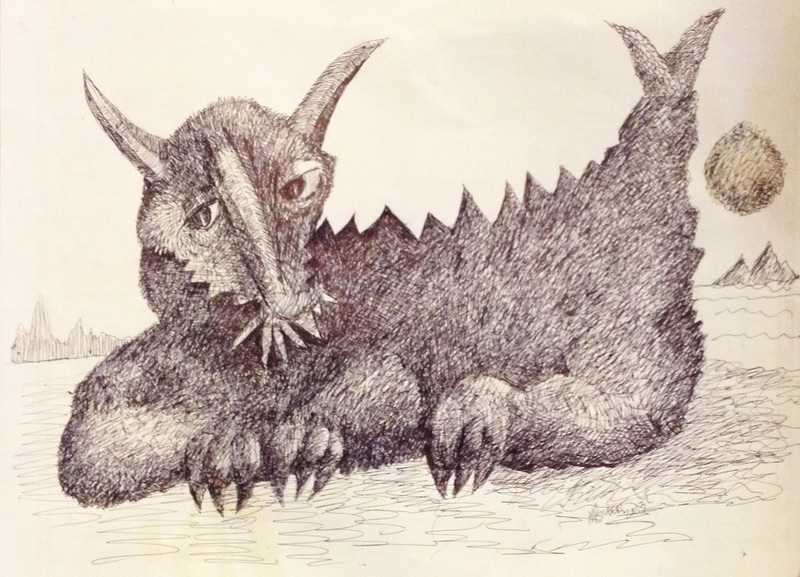 This entry was posted in Uncategorized and tagged ballpoint pen, beast, Canada, dragon drawing, drawing, fantasy, Metcalfe, Ontario, pen and ink, spontaneous. Bookmark the permalink.